Home Kitchen Best Paella Pan Reviews: Authentic Spanish Dishes Start with a Good Pot! Best Paella Pan Reviews: Authentic Spanish Dishes Start with a Good Pot! Question: What is the best paella pan? Whether you’re an avid chef, a culinary explorer, or just an adventurous home cook, anyone who spends time in the kitchen knows that the right tool for the job can spell the difference between Mmmmm and meh. Find the best paella pan under $200 on Amazon. Giving you the proper conduction, heat distribution, and proper construction to create a beautiful paella, these pans are a fantastic addition to any kitchen; even for the chef that “has everything”. While features and aesthetics vary, each of these pans offers professional quality construction and the finest materials to ensure that you serve up the very best for years and years to come. 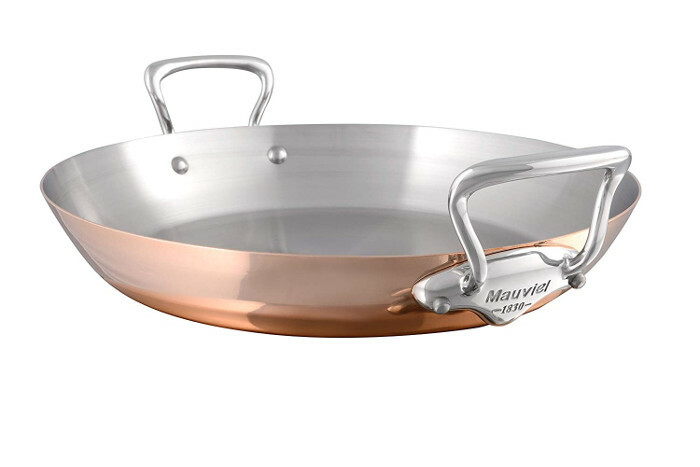 This 14-inch wide bottom pan by Mauviel features a 2mm thick copper construction. Copper is prized for its ability to evenly and consistently distribute heat across the cooking surface. Lined with high grade stainless steel for easy cleanup, it also won’t react with your food. This pan truly is one of the best-of-the-best. While your paella will be the star attraction, this pan serves to dress up any kitchen with its copper construction and beautiful bronze handles. Should anything happen to this well built, heavy-duty pan, you can rest easy knowing it comes with a limited lifetime warranty. Of course, with a price tag hovering around $300 this pan may not be for everyone, but rest assured that this is a purchase that will be handed down through generations of chefs. The Calphon tri-ply is as heavy as heavy-duty gets. This pan is as suited to defending the homestead as it is to Le Cordon Bleu. Unlike some other high-quality cookware, at under $70 this one leaves enough in the grocery budget to buy some dinner food as well. This pan features a 12-inch base, plenty of room to serve paella for four. It boasts a three-ply construction which ensures even heating every time. 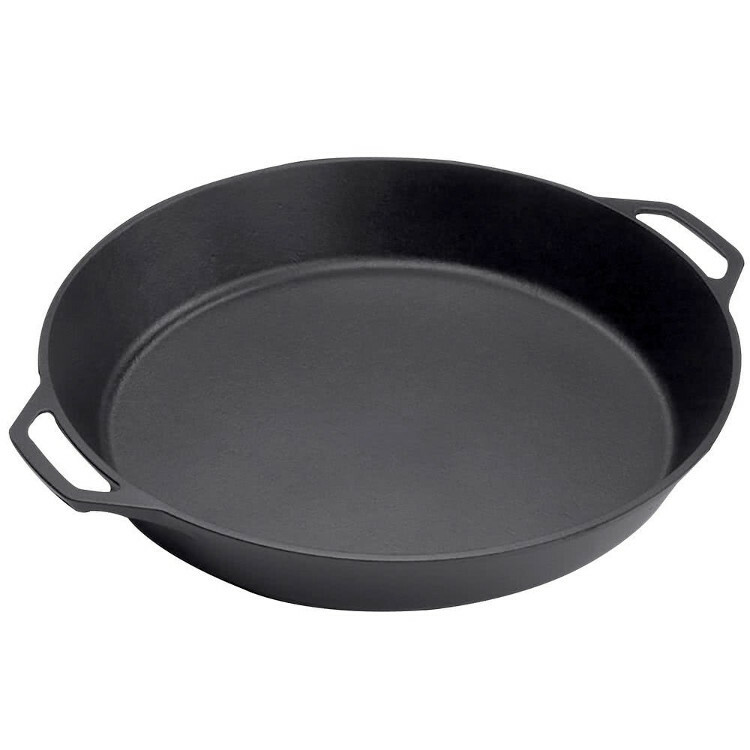 Additionally, its heavy-duty build ensures a lifetime of hard use without any concern for the integrity of your pan. The handles will stay cool on the stovetop, but because this pan has all-steel construction, it is equally well suited for the oven or broiler. Additionally, unlike some “fancy” pans, this one is dishwasher safe. That means no greasy mess soaking on the countertop overnight. Perhaps this isn’t the most elegant option, but for price, quality, and versatility, it’s hard to beat. 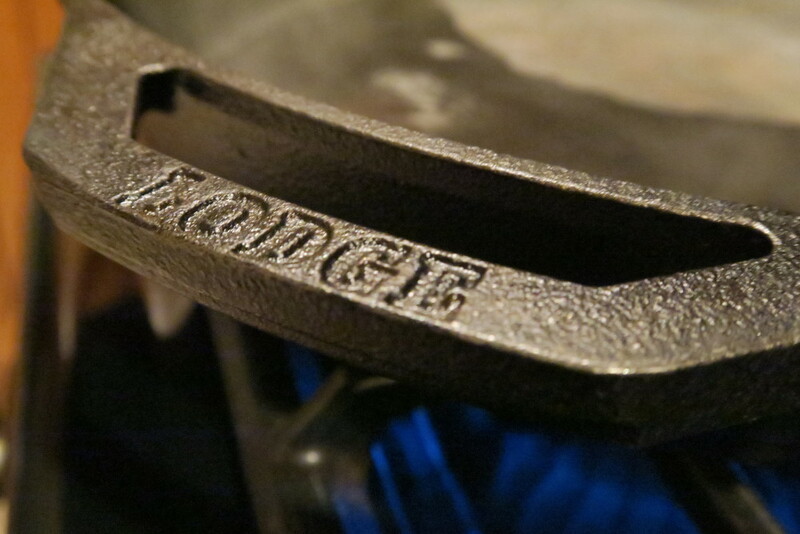 This Lodge cast iron skillet may as well be your great-great grandmother’s pan. Seriously, this is a real-deal cast iron pan big enough to wash the baby in (if need be). At an enormous 17-inches at base, this pan will serve you well for paella, or if you ever need to braise a few chickens at once. It’s simple, time-tested design features dual cast-in handles, so they won’t pull away even after decades of use and storage. Anyone who has worked with cast iron in the past knows that maintenance is a must to ensure usefulness, but this pan comes pre-seasoned. That means a quick wash with hot water and you’re ready for action. Additionally, anyone who has cooked in cast iron knows that there is something special that happens when your food bubbles and steams away on the slab of iron. Teflon is a great invention, but I’ll trade a bit of elbow grease to enjoy the benefits of good iron pan any day. At just over $70.00 it will pay for itself as you watch the delicate pans fill the recycle bin while stirring away in your enormous family friendly cast iron pan. Final review: Who makes the best paella pan in 2019? 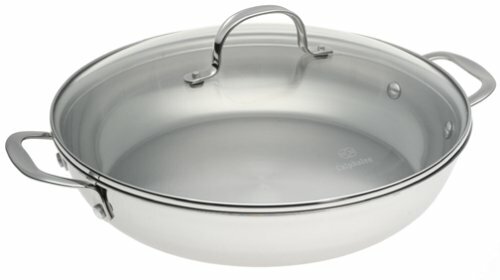 Of course, you don’t “need” a special pan for paella or anything else, but a job worth doing is a job worth doing right. Each of the pans reviewed has its pluses and minuses of course. The Mauviel is an absolute masterpiece. As decorative as it is functional it may be rivaled, but surely is unsurpassed. It is an investment, albeit a hefty one. With the Calphalon, you get a no-worries pan that should serve you well in myriad ways. Braise, bake, roast, broil, sauté…this pan will be a go-to addition to your kitchen; heck, it can even crack walnuts! It’s also nice to know you won’t break the bank with this sound purchase. Call me a romantic, but nothing says home like a cast-iron skillet on the stove filling the home with the promise, and aromas, of a family meal almost ready. While there is a trade-off in that it requires some TLC to keep it in working order, think of the money you can save on a gym membership while you tote this hefty piece of equipment around the kitchen. When it comes to cooking, it’s all just a matter of taste. In the end, any of these pans will get the job done, it’s just a matter of what you’re looking for. Find the best paella pan for the money on Amazon. Best Stainless Steel Cookware Sets on the Market: Reviews of Top Rated Pots and Pans!